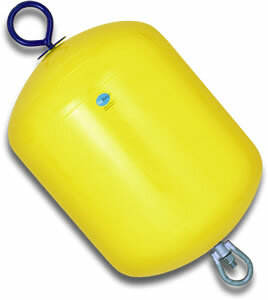 Polyform Norway - MB100 Hard-Shell Foam-filled Rod Buoy - 50cm dia. The Polyform Norway Hard-Shell MB-series buoys are roto-molded from polyethylene (PE) and filled with polystyrene foam (EPS), guaranteeing a compressive strength of 5 mH2O and a density of 250kg /m3. The buoys come complete with hot dip galvanized armature and swivel.